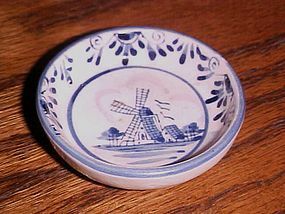 Unique vintage open salt dip is hand painted Delft blue with a windmill center design with border decoration. Measures 2 3/8" diameter and is just 5/8" deep. Marked on the back with a beehive backstamp and says Hand Painted Delft Blue. Perfect with no chips or cracks.